Quiet weather conditions will continue today as temperatures slowly trend warmer. Some rain chances creep onto the forecast boards this weekend. Today and Tonight: Thursday will be transitional as southeast winds and a return of moisture to the atmosphere result in some clouds and a return to above average temperatures. Expect highs to peak near 72 degrees. Overnight lows will be much milder in the upper 50s. Some fog may develop around daybreak—especially near bodies of water. Up Next: A weak, stalled frontal system could create a shower or two on Saturday and Sunday, but any activity should be sparse. Mostly cloudy skies, high temperatures in the 70s and low temperatures in the 60s are anticipated. Morning fog could become an issue. It appears as through the chance for rain will increase by Tuesday and Wednesday, as a deep layer of atmospheric moisture sets up across the region. If the right ingredients come together, there may be a threat for heavy amounts. LSU Baseball: The season opener at Alex Box Stadium looks pretty good—especially for February. There is potential for a few showers with the best chance of this on Sunday. However, the LSU Tarp Crew should not be any busier than usual. The weekend afternoon games will likely have temperatures in the 70s, but with clouds and breeze, you may want to keep a light pullover handy, just in case. The cool, quiet spell will not last long as the high will quickly depart east on Thursday. With surface high pressure parked over the Southeast, onshore winds will return mild air from the Gulf of Mexico. The next upper level trough will move out of the Mountain West and into the Midwest on Saturday evening. Once again, the bulk of action with this event will stay north of the local area. A weak front will slip southeastward through the weekend helping an uptick of cloud cover. However, with mid-level relative humidity in the 70-80 percent range and weak vertical motions, some breaks in the clouds are expected. There may be a passing shower or two late Saturday into Sunday as the front stalls in the region. Any showers should be light and isolated. With southeast winds in the 5mph range and moisture pooling ahead of the front will likely lead to some fog each morning this weekend. 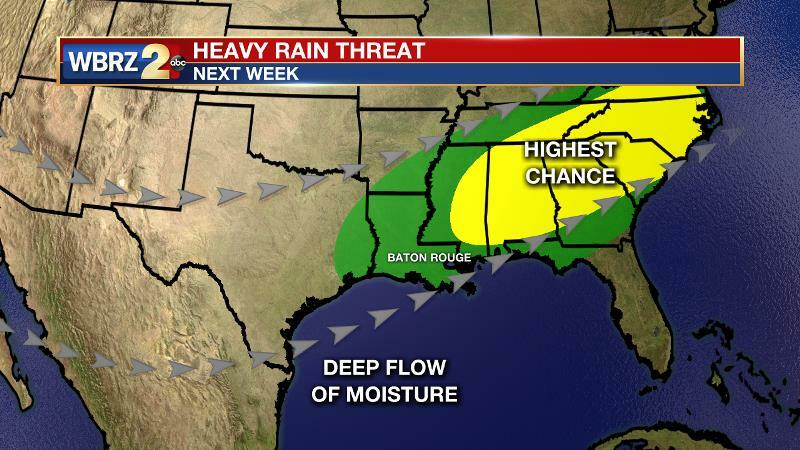 As the front clears the area on Monday, there may be a short break from any rain chances. By Tuesday, that front is expected to retreat north and stall over the coast for a few days. With a deep trough parked in the western U.S. and continued southwest flow aloft, this could lead to a period of elevated rain chances during the middle of next week. Forecast model guidance suggests atmospheric moisture will be near record levels on Tuesday and Wednesday. With sufficient forcing from either a front or upper level disturbances, some heavy amounts could occur. At this time, it appears that the greatest threat for problematic rainfall will stay just northeast of the local area. Stay tuned.